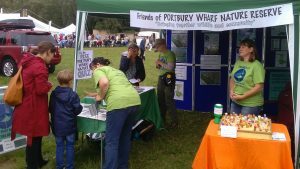 The Friends of Portbury Wharf Nature Reserve are a group of wildlife enthusiasts. We are volunteers from the local community and believe that community has a significant role to play in supporting its local nature reserve. Our aim is to safeguard the nature reserve and its wildlife for future generations. The reserve is an important wildlife and conservation site as well as being a valuable public amenity. So to achieve our aims, one of key activities is to make information about PWNR and its wildlife widely available. We are doing this via this website, on our Facebook and Instagram pages and at local events. We also organise nature trails, guided walks and we do illustrated talks. If your group is interested in arranging a walk or a talk please contact us. Recording the wildlife on the reserve is another of our key activities. We monitor the wildlife by counting the species that visit the reserve. So we can see at a glance how species are faring year on year, we will add these counts to the species pages. You can read more about this at Wildlife Monitoring. Sign up to our Mailing list. The sign up form is at the bottom of this page. Help us monitor the wildlife – going out with more experienced watchers is a great way to learn. Join our organising committee and help arrange activities. Below is an overview of the history of the reserve and the Friends. 2008 – The idea of a nature reserve to offset the building of 2500 new homes was first conceived. Persimmon Homes established a nature reserve on the 150 acre site alongside the new homes. 2010 – Avon Wildlife Trust was appointed to manage the nature reserve. Over the following 5 years they increased the biodiversity. 2015 – The funding for the reserve (a levy paid by the new house owners) was stopped and North Somerset Council (NSC) announced that they were taking over ownership and responsibility for the management of the reserve. Avon Wildlife Trust’s contract was not renewed. A group of wildlife enthusiasts, including local residents, were concerned about the future of the nature reserve. Hence the formation of the Friends of Portbury Wharf Nature Reserve. The Friends set up their first website and community Facebook group. In 2016 – The Friends called a public meeting to ask residents and key representatives of the community if they would support a community run nature reserve. The idea was supported, so a committee of local business people was set up to look into the formation of a community trust to run the nature reserve. However, in the meantime North Somerset Council (NSC) confirmed their decision to take over the nature reserve. So the idea of a community trust was set aside. In 2017 – NSC in negotiation to take over ownership of the nature reserve from Persimmon Homes. NSC offered the Friends a seat on their proposed Management Committee once they had obtained title. In 2018 and 2019 – the Friends continue community engagement activities and promoting the reserve and its wildlife. They look forward to taking an active management role when NSC becomes the owner.